This infographic summarizes water quality information for 1,496 beaches in the Great Lakes and St. Lawrence River watershed. 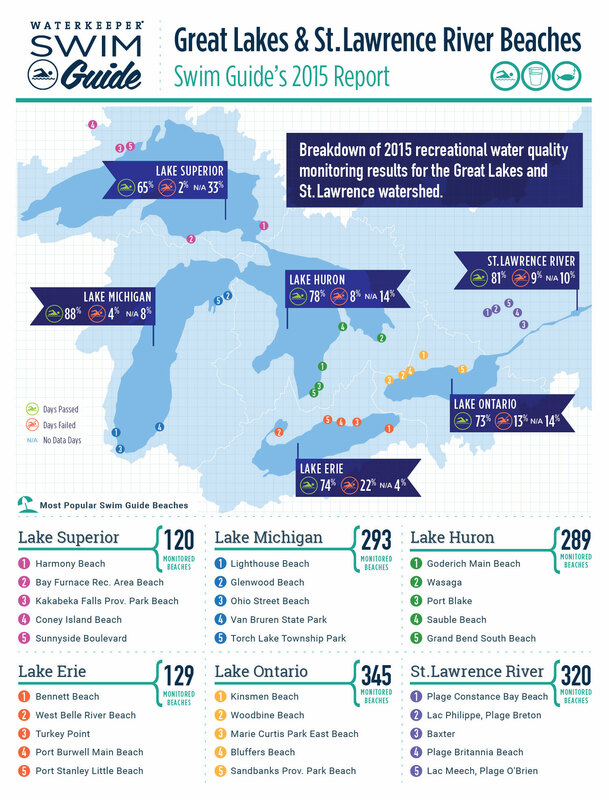 The results of the 2015 Great Lakes & St. Lawrence Beach Report are in and the results are promising. First, the bad news. On Lake Superior, Lake Michigan, and the St. Lawrence River, beaches met water quality standards less often in 2015 than in 2014. There were also more days when water quality was not available. Now, the good news. On Lakes Huron, Erie, and Ontario, the results were better. This year, beaches met water quality standards more often and there were significantly fewer “no data” days. That’s good news for residents and tourists. Overall, Great Lakes and St. Lawrence River beaches met water quality standards 76.5% of the time in 2015. That is an improvement over last year’s 72.5% result. The biggest change between 2014 and 2015 was the decrease in days when no water quality information was available. In 2014, water quality data was not available for 20% of the summer. As Waterkeeper Mark Mattson blogged about this summer, this is a worrying figure. No data days create misleading data, making water quality information that much more difficult to report. Happily, 2015 saw a significant improvement, with the number of “no data” days dropping to 13.8%. That’s a sign that more water quality information is being released to the public more often. Our report also includes a list of the five most popular beaches in each of the Great Lakes watersheds. We measure popularity based on the number of times a beach was viewed in Swim Guide. Some of the 2014 champions were knocked off the list in 2015, so be sure to check your watershed to see what’s up and what’s down. Interestingly, many of the most popular beaches in Swim Guide are also beaches with poor water quality history. This proves that sharing information – good and bad – about beaches serves the public’s interest. Lake Huron and Lake Michigan beaches had fewer “pass” days in 2015, but they also had a corresponding increase in “no data” days. “Fail” days were actually lower than last year, suggesting that beach water quality is not necessarily declining; there is just less information being released overall. Our 2014 St. Lawrence River report only looked at 38 beaches, compared to 320 in 2015. Because of the increase in beaches included in the report, it’s hard to make a direct comparison between 2014 and 2015 results. 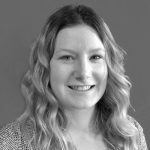 The two biggest sewage spills of the year in Hamilton, Toronto and Montreal happened in October-November, after the swimming season ends. Sadly, the good beach water quality results for the summer do not necessarily mean that the waterbodies are in better health this year. 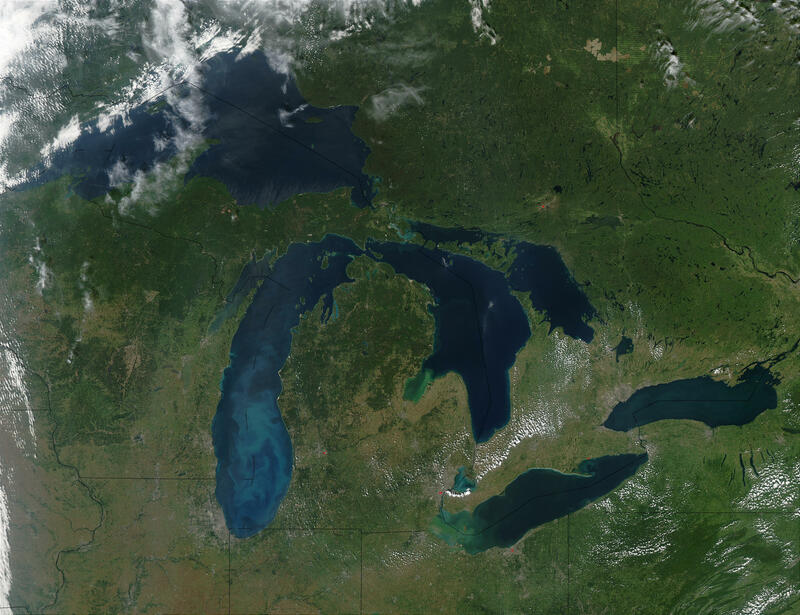 Since we put out the 2014 report, we’ve added 471 more beaches in the Great Lakes and St. Lawrence Basin. Swim Guide has grown by 225,000 more individual users, including 116 680 new users in the Great Lakes region. That brings our all-time user count to 562,000. The biggest growth of 2015 came in Quebec with a 400% increase. To calculate the averages, we first calculated the total number of monitoring days for each lake (sum of total number of days monitored for all beaches). To find the averages we divided the number of days a beach passed, failed, or for which no current or reliable water quality data was available by the total number of monitoring days for each lake. Beaches with an incomplete or partial monitoring record (e.g., new beaches or beaches under construction with less than 5 weeks of monitoring data) were omitted from our calculations. Beaches with unreliable or inconsistent water quality monitoring were also omitted from our calculations. The “most popular” lists were generated based on beach views by Swim Guide users in 2015. The green icon indicates the average amount of time beaches met water quality standards during the 2015 monitoring season. The red icon is the average amount of time beaches failed to meet water quality criteria. N/A indicates the amount of time water quality data was unreliable or unavailable. Most popular does not mean most-visited beach or “best” beach. Kinsmen Beach in the Lake Ontario drainage basin failed water quality tests over 62% of the time, yet it was the most-viewed beach by Swim Guide users. Swim Guide adds beaches based on available monitoring data and user-request. If your favourite Great Lake or St. Lawrence beach is not in Swim Guide please send us a beach request.